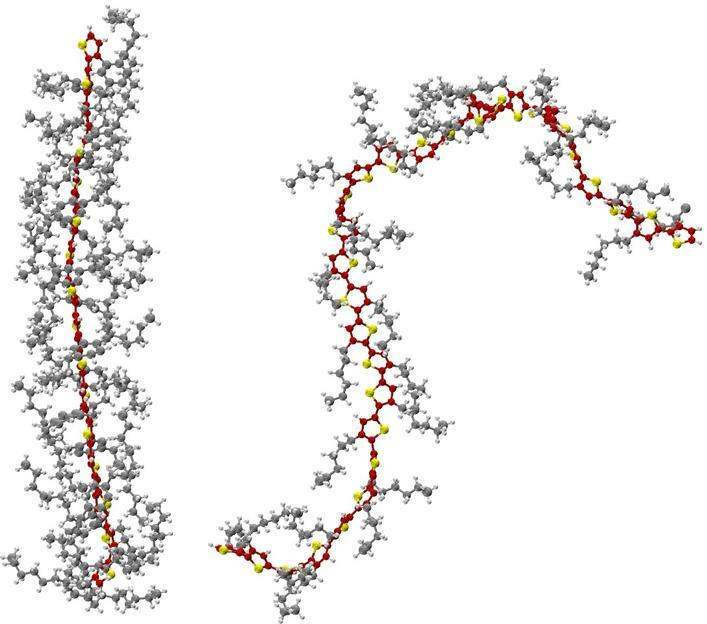 On the left, a polymer with an elongated backbone (red-yellow). 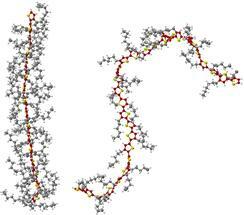 The long side chains (grey) of the molecular building blocks form a scaffold that stabilizes the elongation. On the right, a polymer with a bent backbone. 27-Mar-2018: Organic light-emitting diodes (OLEDs) are used in smartphones and televisions to facilitate the high-contrast display of colours. Conjugated polymers are also often employed as organic semiconductors in such diodes. Researchers at the University of Bayreuth have found out how the spatial structure of these polymers can be used to control the colours of the OLEDs and help to increase the brightness of monitors. Polymers that are well-suited for use in organic light-emitting diodes play a central role in the new research findings. Thanks to the chain formed by connecting molecular building blocks, they possess a backbone. If the polymers are then exposed to a laser beam, they absorb the light and store it as excitation energy. This energy spreads along the backbone. Shortly after that, it is released by emission of light. Up to now it had been assumed that the colour of the emitted light depends on how far the excitation energy spreads along the polymers: supposedly, the more bent the polymers were, the smaller the distance over which the energy spread. However, the scientists in Bayreuth have now refuted this assumption. The polymers they studied have backbones that are chemically identical and bent to different degrees, but the excitation energy always spreads over the same distance. Bent polymers emit green or blue light, while elongated polymers radiate yellow or red light. “When these polymers come to be used in organic light-emitting diodes, their various spatial structures can be utilized to precisely control the colour of the light emit from the OLEDs,” explained physicist Dominic Raithel (M.Sc.). The researchers in Bayreuth also found out that the elongated polymers possess a scaffold formed by its side chains, which stabilizes the elongated structure. “This results in a special advantage for light-emitting diodes: when elongated polymers are layered on top of one another, the scaffolds provide stability. Optical emission is not thereby weakened“, said Raithel, who recently completed his dissertation in the University of Bayreuth’s DFG-funded research training group “Photophysics of Synthetic and Biological Multichromophoric Systems”. In this context, natural and synthetic organic materials are studied in close interdisciplinary cooperation. For example, experimental physicists Prof. Dr. Anna Köhler and Prof. Dr. Jürgen Köhler along with Prof. Dr. Mukundan Thelakkat, expert in functional polymers, were involved in the new experiments. The comparative experimental investigations of polymers made use of different types of spectroscopy methods. “A decisive factor was single-molecule spectroscopy at very low temperatures, for which Bayreuth provided us with its high-performance infrastructure. Using this method, we were able to determine the colour of the emitted light and finally the extension of excitation energy over the chain-like polymers,” explained Dr. Richard Hildner, who coordinated the research at the University of Bayreuth. The scientists in Bayreuth worked together closely with a research group at Rice University in Houston, Texas. Dr. Lena Simine and Prof. Dr. Peter J. Rossky carried out extensive calculations on the impact of polymer structures on the colour of the emitted light. Linking experimental and theoretical methods led to insights into the spatial structures of individual polymer chains which would have been impossible using traditional imaging techniques.